Arsenal injury updates ahead of Liverpool clash: Arsenal will be hosting Liverpool in their third Premier League on Monday night at the Emirates Stadium. Arsenal manager Arsene Wenger has revealed the injury updates ahead of the Premier League game against Liverpool. Arsenal will be hosting Liverpool in their third Premier League on Monday night at the Emirates Stadium. The Gunners boss Arsene Wenger has given the following injury updates. Arsenal will be without three players Jack Wilshere, Tomas Rosicky and Danny Welbeck. All these three have not featured in any of the first two games in the Premier League. 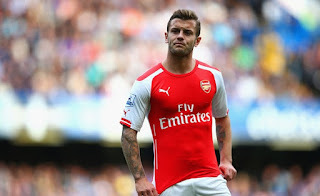 Midfielder Wilshere who was predicted to return this week is now sidelined for atleast three weeks. The Englishman will be missing this important game against Liverpool and also two games for his country England in the European Championship qualifiers. The 23-year-old has been out with an ankle injury which he suffered during training. Wenger told that he will return after the international break. While Danny Welbeck who has been out since April is yet to recover from his injury. The English striker is making good progress but the return date in unknown. Tomas Rosicky who signed a one year contract extension in the summer is yet to play any game this season. Rosicky is recovering very well but will take two months to get back to training.